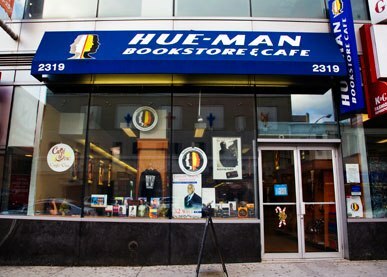 Sad news from Harlem: the Hue-Man Bookstore & Café is closing its doors at the end of the month. Still, Hue-Man intends to continue selling books online, offering publishing services and holding author events--apparently maintaining such programs as the Page to Stage program, "a concert of words" begun last year in association with Symphony Space in New York City and taken on the road (Shelf Awareness, October 21, 2011). "So what next? While we are figuring out our amazing bookstore of the future, I will be working on several projects which will focus on giving ethnic writers an advantage in the marketplace. We will continue to be involved in the publishing of books and will ramp up our agency services to writers and publishers alike.... Partnering with a state of the art facility we can begin to create the kind of multi-platform customer experience we've always imagined. Stay tuned!" The store was founded in 2002 by Clara Villarosa, who had been the longtime owner of the Hue-Man Experience in Denver, Colo. Villarosa retired in 2005. Marva Allen is CEO and partners have included Rita Ewing, Celeste Johnson and Melvin Van Peebles. Hue-Man has been one of the leading African-American bookstores in the country and was the site of many high-profile events, including a lively signing on pub date for Bill Clinton's My Life in 2004. Founded in 2009, Sue's News, the newsstand and bookstore in St. Louis, Mo., is closing at the end of the month, the St. Louis Post-Dispatch reported. Owner Richard Bannecker, who named the store for his late wife, who had worked in a Barnes & Noble for a time and liked bookstores, said, "It's a tough business to be in right now. All retail is tough. But books are particularly tough. Amazon has had a huge impact on everything. They came up with a good model. But it hasn't worked out for the rest of us." Another problem: Bannecker told the Riverfront News that the store's landlord in the St. Louis Galleria had moved his storage space into an "unusable" area. Still, Sue's News did well, he said, with children's books and "the occasional blockbuster book" like Fifty Shades of Grey. 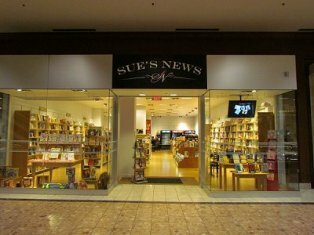 Sue's News originally opened in Kirkwood as a newsstand, then moved two years ago to the Galleria. 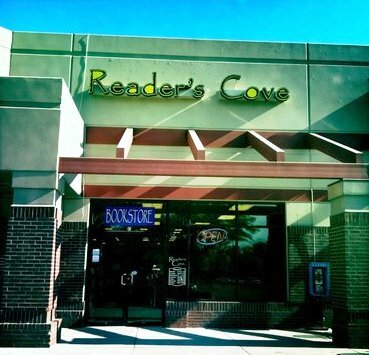 Citing the economic downturn of 2008-2009, online competition and "inadequate initial funding," Reader's Cove bookstore and its Half Moon Coffee Co., Fort Collins, Colo., are closing this Friday, according to the store's website. "It has always been my dream to be a bookstore owner and even at this hour, I would not have traded away this opportunity," owner Charles Kane wrote. He founded the store in 2006 and said the store "never really recovered from the economic downturn" and has been "hanging on by our fingernails for a couple of years." He also listed mistakes such as "lack of proper signage on the marketplace corner," "location challenges" and a "steep learning curve" for finding its niche of customer and for buying and dealing with vendors. It's like an old Soviet joke: in brave new digital world, you do not read e-reader, e-reader reads you. 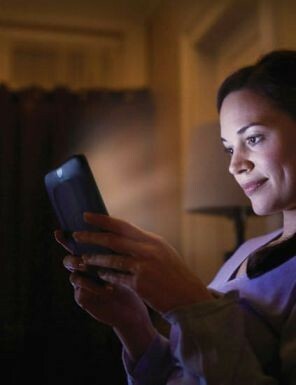 The Wall Street Journal details how e-reader makers are monitoring reading habits of consumers. "The major new players in e-book publishing--Amazon, Apple and Google--can easily track how far readers are getting in books, how long they spend reading them and which search terms they use to find books. Book apps for tablets like the iPad, Kindle Fire and Nook record how many times readers open the app and how much time they spend reading. Retailers and some publishers are beginning to sift through the data, gaining unprecedented insight into how people engage with books." In the case of Barnes & Noble, which focuses on groups of readers rather than individuals, "data collected from Nooks reveals, for example, how far readers get in particular books, how quickly they read and how readers of particular genres engage with books." The company has found that "nonfiction books tend to be read in fits and starts, while novels are generally read straight through, and that nonfiction books, particularly long ones, tend to get dropped earlier. Science-fiction, romance and crime-fiction fans often read more books more quickly than readers of literary fiction do, and finish most of the books they start. Readers of literary fiction quit books more often and tend skip around between books." Jim Hilt, B&N's v-p of e-books, told the Journal that the company is starting "to share their insights with publishers to help them create books that better hold people's attention." It has also introduced shorter nonfiction works called Nook Snaps on "topics ranging from weight loss and religion to the Occupy Wall Street movement." For its part, Amazon, which has Kindle users sign an agreement allowing it store information from the device, "can identify which passages of digital books are popular with readers, and shares some of this data publicly on its website through features such as its 'most highlighted passages' list. Readers digitally 'highlight' selections using a button on the Kindle; they can also opt to see the lines commonly highlighted by other readers as they read a book. Amazon aggregates these selections to see what gets underlined the most. Topping the list is the line from the Hunger Games trilogy. It is followed by the opening sentence of Pride and Prejudice." The trend, of course, raises many issue concerning privacy even as many welcome finding out more about readers' habits. The article goes into great detail on the subjects. Amazon plans to create a digital bookstore in Brazil sometime between October and November of this year, Reuters reported, citing Brazilian publishers and an industry source. Because of logistical problems and complex taxes, it will be the first Amazon bookstore that sells only e-books, not printed books. Pedro Guasti, director of research firm eBit in Sao Paulo, said that in 2012, Brazil "should reach $12 billion in sales online, a level that justifies their entry. If they wait much longer it would become very expensive." Amazon has signed contracts with approximately 30 Brazilian publishers "and is rushing to build a portfolio of some 10,000 electronic books," Reuters noted, adding that the company projects acquiring 90% of Brazil's e-book market, "in part because many Brazilians already download content from its site using readers they bought abroad." Brazil currently accounts for 1% of global traffic to Amazon's websites. Brazil is a country "where labor costs are high, taxes complex and less than 20% of roads are paved.... local competitors say Amazon would first have to prove it can compete in the challenging environment," Reuters wrote. "They are going to face the same kind of problems we always had," said Sergio Herz, director of Livraria Cultura, which has bookstores in a dozen locations. "Until now they were in heaven and we were in hell. Come to hell with us, Amazon." NBC Acquisition Corp., which owns Nebraska Book Company, has completed its restructuring and emerged from bankruptcy. Owned by Weston Presidio, a San Francisco investment firm, NBC Acquisition had filed its "pre-packaged" bankruptcy in June 2011. New president and COO Steve Clemente said, "We are back and stronger than ever." Likewise CEO Barry Major said, "We are emerging a stronger company aggressively focused on future growth." He cited "the acquisition of 23 new stores, our latest being Portland State University Bookstore. We also dramatically expanded our industry-leading rental program with our commercial accounts." 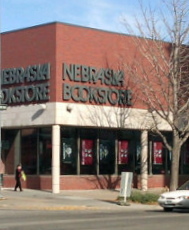 Nebraska Book Company operates 251 college stores, has 2,500 bookstore customers for its textbook division and has 1,600 technology platforms and e-commerce sites used by various bookstores. During the past year, the company said it planned to focus on on-campus college stores and thus closed about 40 off-campus stores. 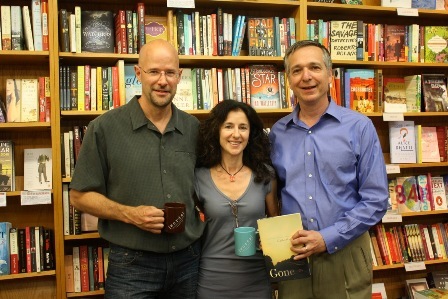 Last Thursday, some 85 fans came to [words] bookstore, Maplewood, N.J., to hear Cathi Hanauer read from her new novel, Gone (Atria). One member of the audience--perhaps her biggest fan--was her husband, Daniel Jones, an author as well as editor of the New York Times "Modern Love" column. While the event for Gone went swimmingly, the night was extra special for Hanauer and Jones: it was their 20th anniversary. Owner Jonah Zimiles commented: "I thought it was pretty dedicated for her to come down from Northampton, Mass., to do the reading on her 20th anniversary!" Here (from l.): Jones, Hanauer and Zimiles. Congratulations to Janeen Solberg, who has been named Steffie Walker Bookseller of the Year by the Romance Writers of America. 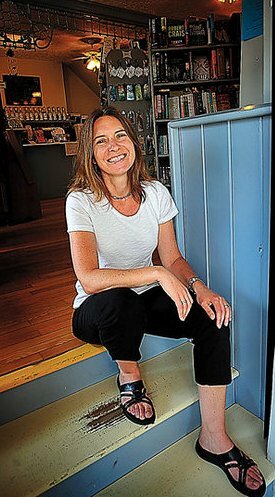 She is manager of Turn the Page Bookstore, Boonsboro, Md., owned by Bruce Wilder, whose wife is Nora Roberts. RWA wrote in part that Solberg "arranges all of the store's events and hosts its book club. Solberg also arranges romance-friendly book signings and is known to enthusiastically recommend romances to the store's patrons." She receives the award at the RWA conference July 27 in Anaheim, Calif.
"I'm incredibly proud to receive this award and represent Turn the Page Bookstore; not only Nora and Bruce, but our staff," Solberg told the Herald Mail. "We're a small team. But we have a big love of romance. We value the industry and the bricks and mortar stores that are putting books into the hands of readers and providing a sense of community in our neighborhood--be it the streets of Boonsboro or our friends around the globe." 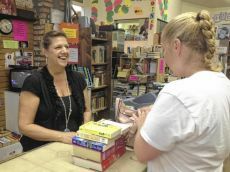 As a temporary antidote to what has been "a tough year" for the Corner Bookshop, Yuma, Ariz., the sales floor "buzzed with customers" last Thursday, thanks to a cash mob organized by the Arizona Western College Small Business Development Center, the Yuma Sun reported. Owners Jean Chism and her daughter, Susan Chism Richards (left, in photo), appreciated the community's show of support. "This is one of the greatest things," said Richards. "We feel blessed, we really do. Every little bit helps.... This has been the worst year in the last five years." Richards saw future promise for the cash mob concept: "Even those don't make it today now know we're here. In the next few weeks I get the feeling we'll be seeing people who didn't know we were here before." 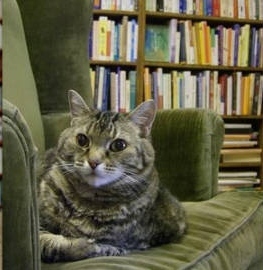 Buzzfeed showcased "12 Cuddly Bookstore Kitties," cautioning that you can find "these cats in bookstores across the country, but don't interrupt them when they're reading 'Furry Shades of Grey.' "
Desserts in Jars: 50 Sweet Treats that Shine by Shaina Olmanson (Harvard Common Press). This morning on MSNBC's Morning Joe: Frank Deford, author of Over Time: My Life as a Sportswriter (Atlantic Monthly Press, $25, 9780802120151). This morning on CNN's Early Start: Squire Rushnell, author of Divine Alignment (Howard, $19.99, 9781451648560). Today on Tavis Smiley: Paul Ingrassia, author of Engines of Change: A History of the American Dream in Fifteen Cars (Simon & Schuster, $30, 9781451640632). Tonight on MSNBC's Last Word with Lawrence O'Donnell: Glenn Greenwald, author of With Liberty and Justice for Some: How the Law Is Used to Destroy Equality and Protect the Powerful (Picador, $16, 9781250013835). Tomorrow he is also on MSNBC's Morning Joe and Current's Viewpoint with Eliot Spitzer. Tomorrow on NPR's Talk of the Nation: Daniel Smith, author of Monkey Mind: A Memoir of Anxiety (Simon & Schuster, $25, 9781439177303). Tonight on a repeat of the Daily Show: Senator Marco Rubio, author of An American Son: A Memoir (Sentinel, $26.95, 9781595230942). 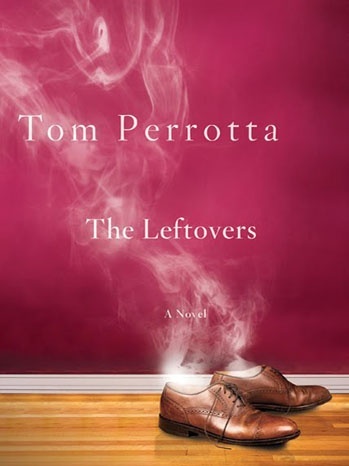 Damon Lindelof's first television series since Lost will be an HBO drama adapted from Tom Perrotta's novel The Leftovers. Deadline.com reported that HBO acquired rights to The Leftovers for series development last summer, "shortly before the book came out. Lindelof read the novel that fall and word is he immediately fell in love with it. He tracked the rights down to HBO, which is a network he, like many writers, had been looking to work at." Lindelof and Perrotta will co-write the adaptation. Warning: suspension of disbelief is required before proceeding. Imagine a small, solitary figure walking slowly along a winding track somewhere in the central Australian desert, "about two feet tall and covered with short brown fur," by Howard Anderson's description. "He had a short, thick tail that dragged on the ground when he walked upright and a ducklike bill" where his nose would be--oh, and he's carrying an empty soft drink bottle. Meet Albert, a recent escapee from the Adelaide zoo. This platypus wanted to be free, to discover a place where things haven't changed: Australia "like it used to be." Now he's out of his native element; cut off from water, he is lost and dying. So begins Albert of Adelaide, Anderson's charming and delightful first novel. Shelf Talker: Join Albert the platypus on a delightful, sometimes harrowing, road trip in Australia during which many things happen--not all of them good.